Confession: I love Ramen Noodles. Actually, I love any noodles. But I hate the salty flavor packet that comes with the noodles. I'm not even sure why they label them with different flavors. They should all just say "Salt Lick." But hating the flavor packet does not stop me from buying and using them. 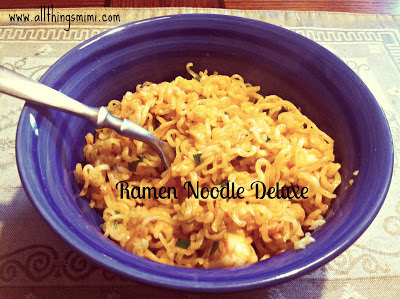 To me, it's all about building flavors for the liquid in which you are going to boil the noodles. You've only got 3 minutes, so you need to pack a wallop right off the bat! To a small sauce pan of water (just enough to cover the noodles), I add 2 chopped Thai red chiles, one small smashed piece of fresh ginger, a smashed piece of lemon grass (I get mine from Amazon- you could also use the paste from the grocery store) and a smashed clove of garlic. If you've got some kefir lime leaves, crush a couple and throw them in, or you can use some pieces of lime zest. Do this while the water is cold. Then put it on medium heat. Let it sit and fester for a good 5 minutes at least (you want a pretty good simmer to extract the flavor from your solids). Fish out the solid materials if they freak you out when you eat the noodles. Then lemon grass and lime leaves/zest are the only non-edible things, though. Then turn up the heat and bring it to a boil. Throw in the magic noodles and boil them for their 3 minutes. While the boiling is going on, I like to contemplate my add ins. Sometimes I dice up firm tofu, sometimes shredded rotisserie chicken... any meat or veggie will do. Actually, sometimes I just want the broth and the noodles! After putting the soup in a bowl, I usually add a few dashes of soy sauce, some chopped scallions, maybe some sesame seeds, or even a little teriyaki sauce (especially with chicken or shrimp). Oh- don't forget some fresh cilantro or parsley right before you sit down to eat it. The fresh herbage makes a difference! You don't even have to go Asian. You can make them many flavor you want! Why not try a little leftover marinara and freshly grated parmesan with some fresh basil leaves? Or more traditional chicken soup with thinly sliced celery and carrots and onions (that broth may need to boil a little longer to soften the veggies before you add the noodles). You might even want to throw some celery seeds in the broth as well. If you really want the flavor of the packet, you can make your own. I've added chicken base, celery seeds and salt to the broth and it tastes pretty close. Just don't use the packet. It's gross. And gross for you. Life's too short to eat bad food!